On the 22nd of June 2018 the Vets with Horsepower will stop in Boden to deliver high-quality talks for horse enthusiast and professionals as well as CPD lectures for vets in Sweden and Norway. ​The aim is to raise funds for three charity projects in need; Saving the Survivors, the Dakar vet school and the Smile Train. The vet CPD hours are accredited by the CPD standards office. The CPD event and talks will be held at Hästkliniken i Norr. Dr Jantien van Haaften at Hästkliniken i Norr. Please contact her directly or fill in the contact sheet at the bottom of the page. Fill in the form below and the local organisers will answer your questions and/or register you. Your details will NOT be used for marketing etc, and will only be passed on to the local organiser so they can contact you regarding your question or your registration. Please note stream 3 (wetlabs by Jessica Kidd) is accessible for vets only, and has limited spaces. Stream 1 is aimed at vets and is at accredited CPD level, but anyone who is interested in the topics is welcome. The morning of Stream 2 is aimed at equine professionals (physiotherapists, equitherapists and others), horse owners and other enthusiasts, but vets are also welcome. 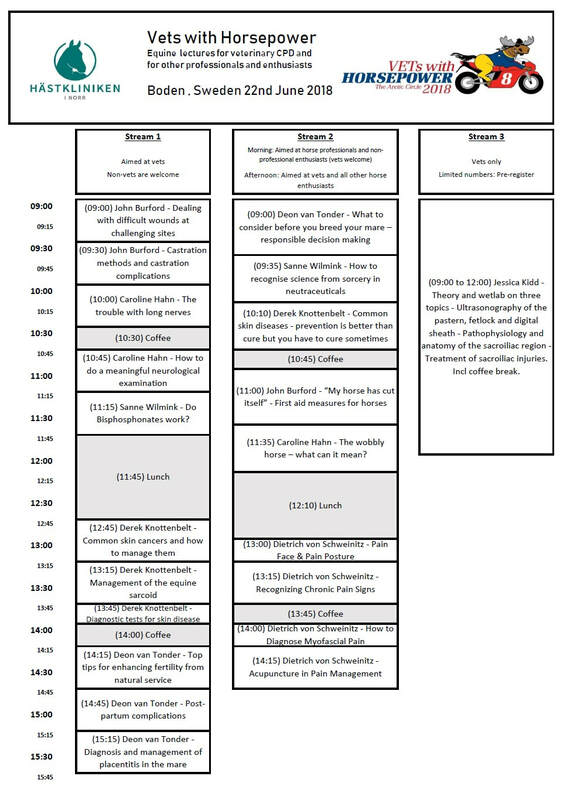 The afternoon of Stream 2 will be most relevant to equine professionals (physiotherapists, equitherapists and others) and vets, but also be interesting for other enthusiasts.